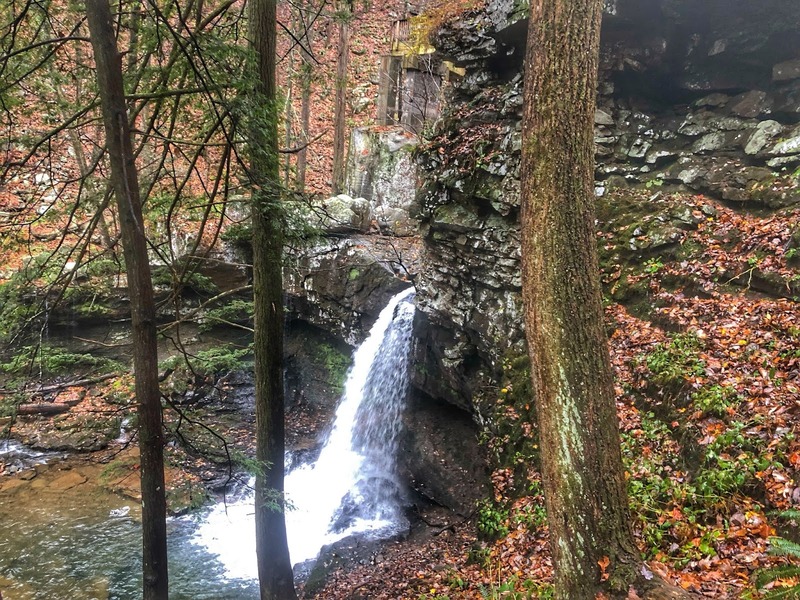 One of two beautiful waterfalls inside Cloudland Canyon. 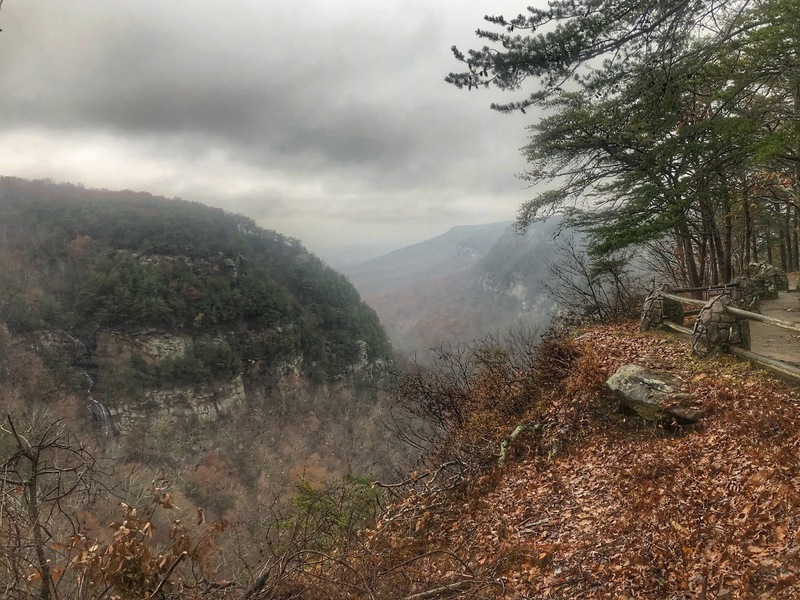 I had yet another year of amazing adventures in 2018 and the Chattanooga 100 Miler was supposed to be the icing on the cake. It was at the tail end of a heavy ultra and mountain running season and I had not race plans other than to cross the finish line feeling well. 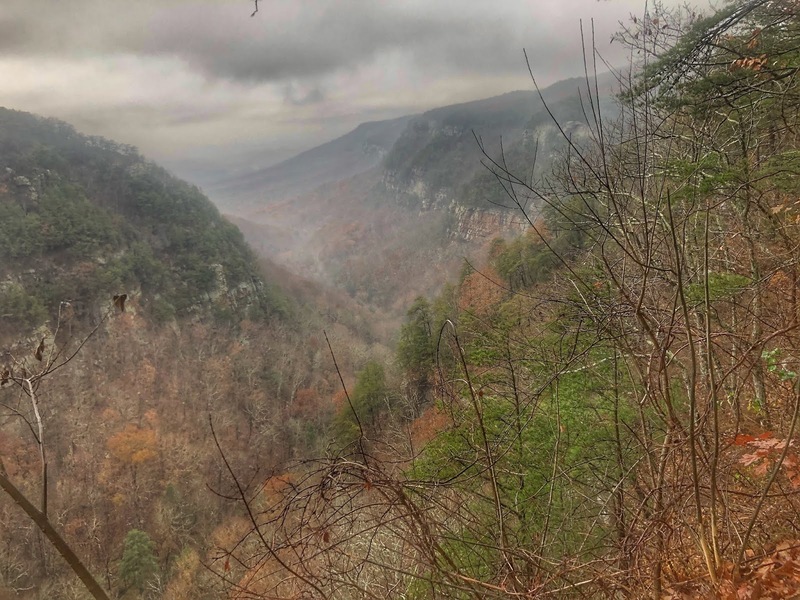 My buddy Paul had broken his neck (yep, you read that right) earlier in the year during a trail race and the Chattanooga 100 Miler was both his comeback race (#BrokenNeckTo100Miler) and his last chance to secure the final points he needed to secure himself a starting spot at the 2019 UTMB. 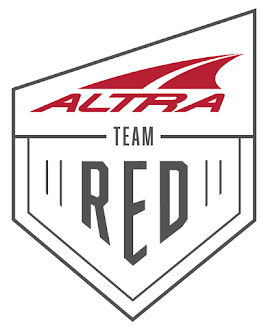 Our entire Huntsville crew (Paul, Jerry, Jeff, honorary Huntsvillian Jan and myself) had signed up to be there with him for this awesome challenge. A friendly "wild" pig in the middle of the trail at the bottom of the canyon. Jerry's wife Wonda had organized a huge hunting cabin (really, it was more of a mansion) with enough bedrooms for all of us and our better halves just 30 minutes from the race start in Cloudland Canyon State Park, Georgia. Since the race started on Friday morning at 8AM, we had to be in Chattanooga on Thursday evening for our packet pickup at Rock/Creek. I was the first to arrive with a beer in hand by the time the rest of the gang showed up. Creek view along the trail inside the canyon. 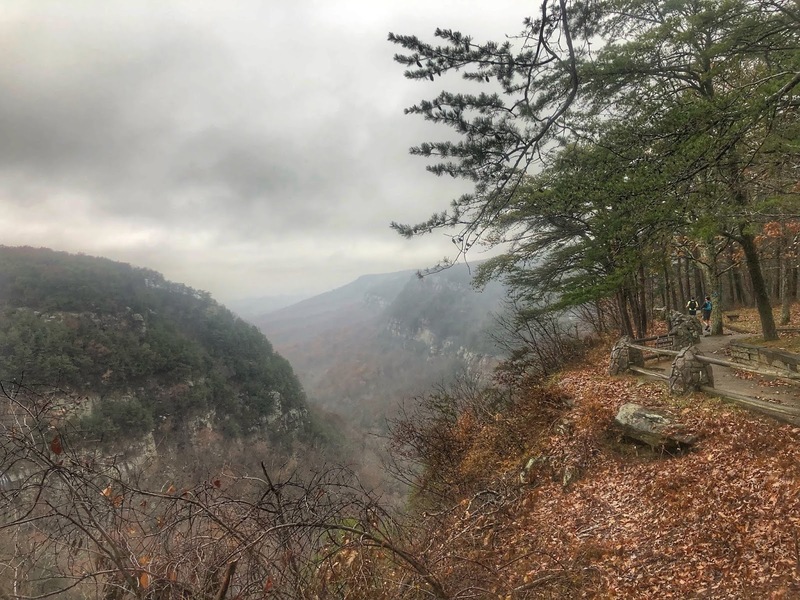 The Chattanooga 100 Miler is an out & back race course that takes runners from Cloudland Canyon State Park all the way to Covenant College atop Lookout Mountain before sending them back to the state park. 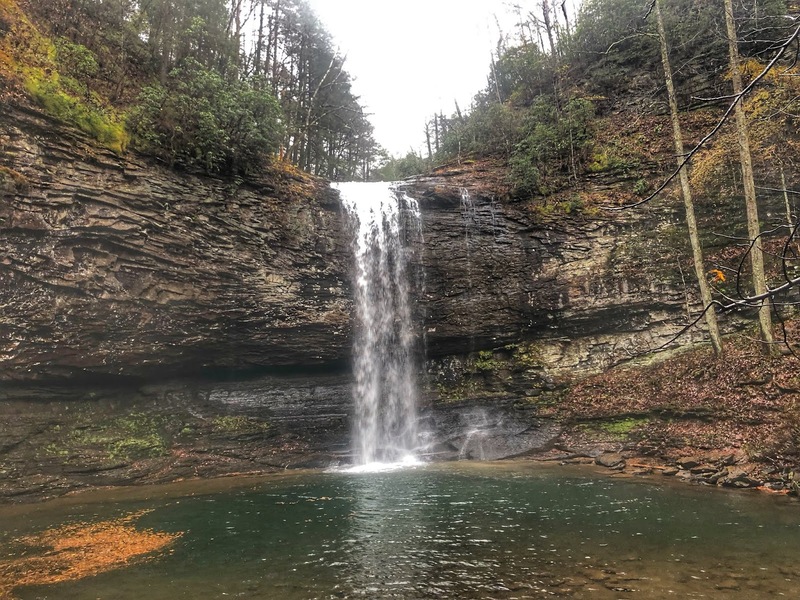 Along the way, runners climb nearly 12,000ft while traversing in and out of Cloudland Canyon along beautiful waterfalls. There's even a "fun" bouldering and rope assist section on the return leg of the course. Most of the course runs on beautiful single track with some technical trails early and late in the race. 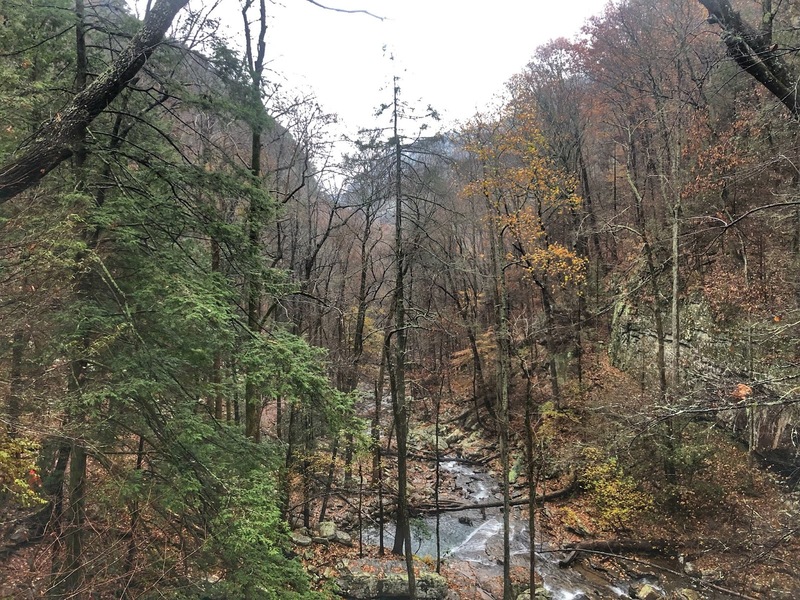 However, most of the course is fairly easy trail with only a very short road section, but because it rained for more than 24 hours during the race, the entire course was rather challenging. 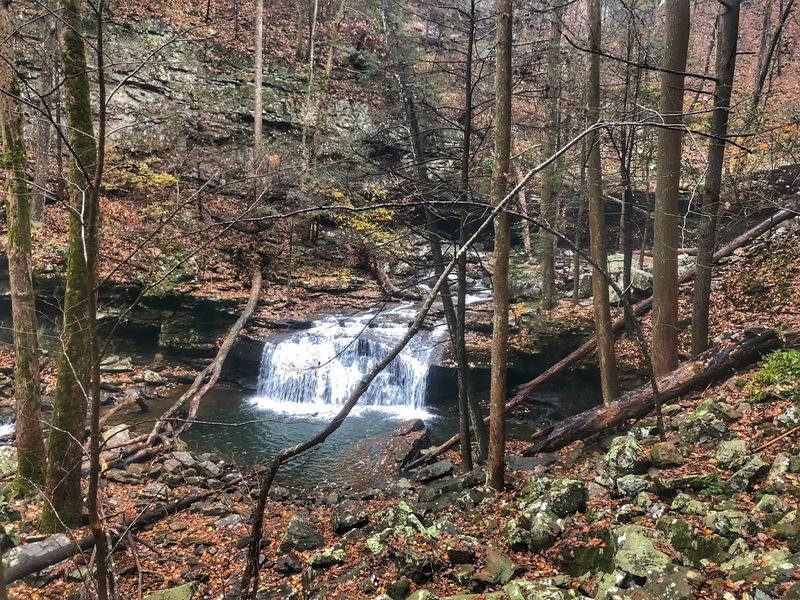 That combined with the continuously dropping temps added to make not only for an epic adventure, but for an extremely challenging 10 miles as well. Heavy rains the previous 24 hours had the water flowing exceptionally strong. An 8AM race start allowed all of us to get plenty of sleep the night before the race. Luckily, my running crew was kind enough to join me for dinner at a fantastic vegan restaurant in Chattanooga, Sluggo's. Check it out, if you're ever in town and you're either vegan or just feeling adventurous. Our early dinner right after packet pickup meant we had plenty of time to lay out our racing gear before calling it an early night. More views from the canyon trail. By 5:30AM the next morning, everyone had slowly gotten up to get ready for the big day. Everyone had brought along their preferred pre-race breakfast items. I had my usual cup of coffee. The plan was to leave the house by 6:30AM to make the 30 minute drive to the race start. With lots of rain in the forecast for the day, I kept going back and forth between a windbreaker and a rain jacket, but ultimately settled for the windbreaker, since the temperatures were supposed to be mild. We arrived at the race start just after 7AM with plenty of time to check in and to catch up with friends old and new. In fact, I bumped into one of my early running adventure buddies, Dan "The Man" Burstein. Dan and I had run a few 100 milers together in my early ultra running days, including an awesome Rim2Rim2Rim run at the Grand Canyon. It was awesome to catch up with this guy. 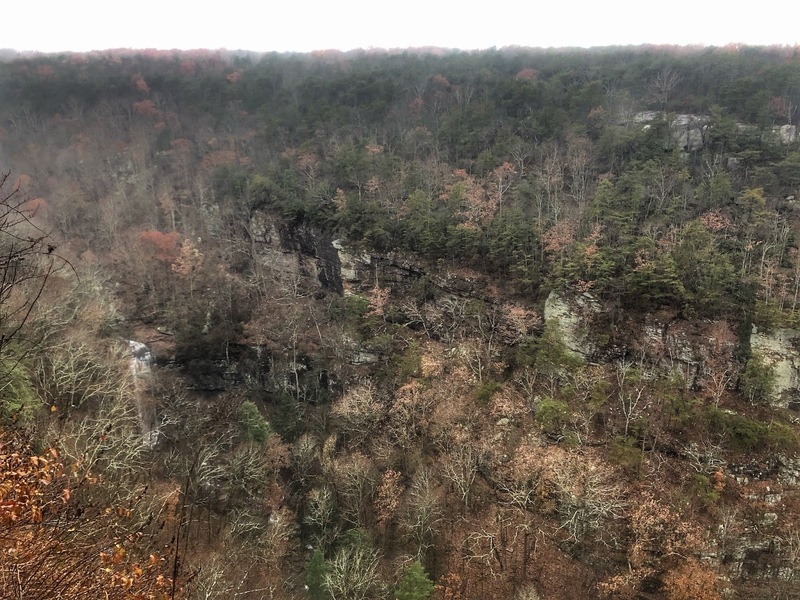 Views of Cloudland Canyon from the rim trail. There were many other familiar faces at this race and there is something very comforting about seeing them toe the starting line alongside you as you embark on a 100 mile trail race. 100 milers to me are still the great unknown. Unforeseen any injury, you can pretty much map out how a race will unfold for you from the 50K all the way to the 100K distance, but when it comes to 100 miles, it is impossible to foresee the outcome. So many things come into play, both internal and external. There is nutrition, hydration, electrolytes, salt, potassium, carbs, sodium, etc. There is the weather, unpredictable as ever, hot, cold, wet, dry, etc. There are the trail conditions, wet, dry, muddy, single track, jeep road, asphalt, etc. There is climbing and descending, right and wrong gear choices, the list is nearly endless for things to go right and oh so very wrong. The race started after the usual pre-race pep talk by Run Bum Sean Blanton. I had lined up somewhere in the second or third row, fully intent on running very conservatively from the start. Since this was a bonus race of sorts for me, I hadn't really had the kind of training cycle I usualy aim for heading into a 100 mile race. After UTMB in September, I had taken it rather easy, only running occasionally and participating in a couple of ultras and a few short distance races from 10K to half marathon. When I had planned to ramp up my training, I had gotten sick with a flu like virus, keeping me from running for nearly 3 weeks. O e could say, I had an extended taper leading into this race, which meant I had no idea what the day would or could bring for me. However, as it always the case as I get closer and closer to a race with lowered expectations, I still somehow thing I might be able to get a good performance out of myself. In this case, I actually thought (quite delusional I might add) I could try for a PR, if I started conservatively enough. That would mean to run a time faster than 21 hours 30 minutes. 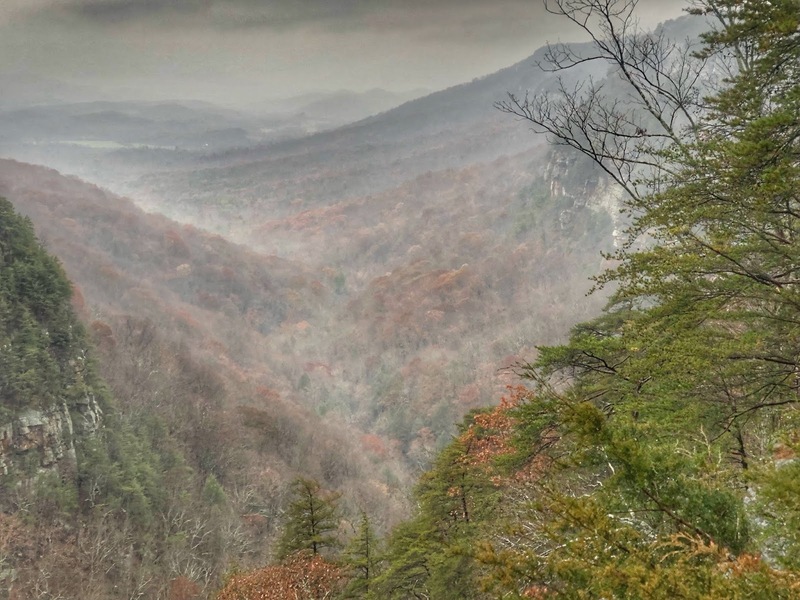 Heavy fog cover hung inside the canyon like a canopy cover. I settled in with Drew Cox, a runner I'd met at the Cannonball Ultra in Chattanooga, TN just a month earlier. We chatted for a bit, making the first 6 or so miles go by very quickly. 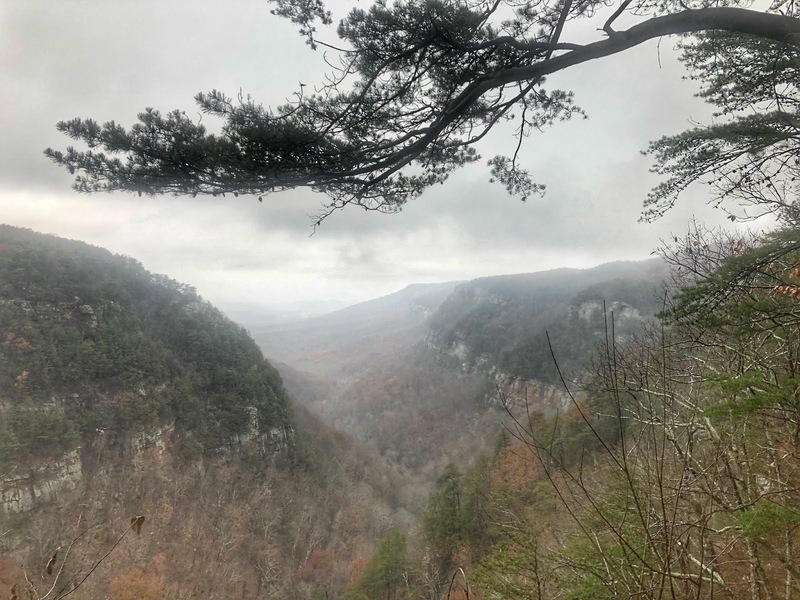 The first 13 miles of the course consisted of a loop inside the state park that had us running along the canyon rim as well and do an out and back into and out of the canyon past a couple of spectacular waterfalls and along a rushing creek. Beautiful view of the canyon. Speaking of sightings along the trail, I did have a couple of "wild" animal encounters. 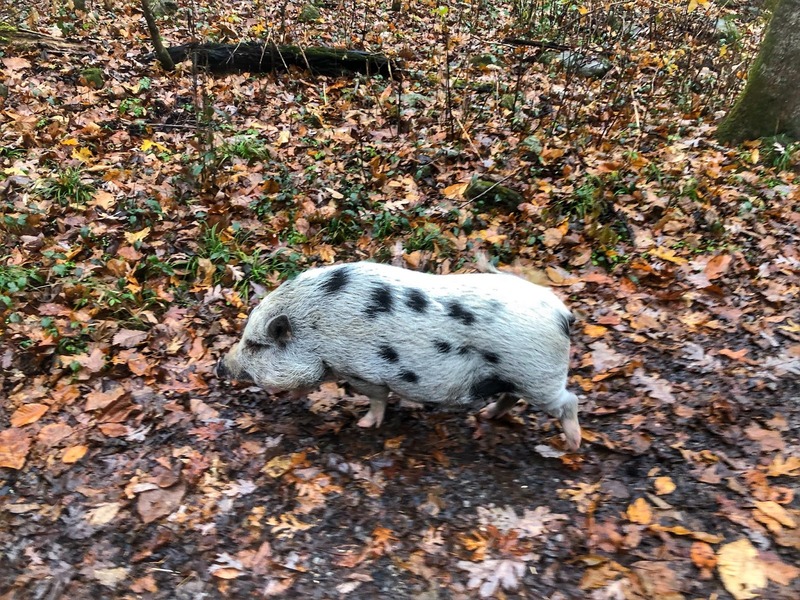 The first encounter was with a spotted pig that was just wandering around on the trail inside the canyon, checking out runners as they passed by, looking for food. It would actually let you close enough to pet it. I'm not sure, but if I had to take a guess, this pig probably belonged to a farm somewhere and got away. However, from what I could tell, we were nowhere near a farm. Definitely the most unusal animal spotted during a trail race for me. The second "wild" animal spotting would be just a few miles later along the course, where we were running adjacent to a fenced in private property for just 100 yards or so. This time, it was a slightly less friendly pitbull barking at us from behind a fenced property. I had barely uttered the words "thank god this little fella is behind a fence, when I suddenly appeared in front of us as we came around a bent in the trail, without any fence between us. He started charging at Andrew Bustos for just a second, but when Andrew stepped towards him, he backed off again. For some reason, we all ran up that next hill just a bit faster. I think an ever so small adrenaline rush had something to do with that. Andrew and I had started running together as we were making our way into the canyon. We ended up running together for the first 50K of the race. Andrew was running his first 100 miler and he had a plan. After 50K, he dropped me like a bad habit and I would not see him again until the finish line. He finished about 20 minutes ahead of me. Congrats on an awesome first 100 miler, Andrew! Way to push through some rough conditions. Speaking of conditions, the course was mostly undulating terrain with a few bigger climbs along the course. Times would have been much faster and the finishing rate would have been much higher, had it not been for weather and trail conditions that continued to deteriorate all day and all night. The rain became more steady and the temperatures continued to drop. I had grabbed my headlamp from my drop bag around at mile 45 at the Lula Lake AS, but wouldn't need it until just before the turnaround at mile 51 at Covenant AS. I had also changed from a windbreaker to a tape sealed rain jacket, which was definitely a key decision for my race. Temperatures would vary greatly as would the winds and the driving rain. I regulated my body temperature by zipping my jacket up or don and by pulling the hood on or off. 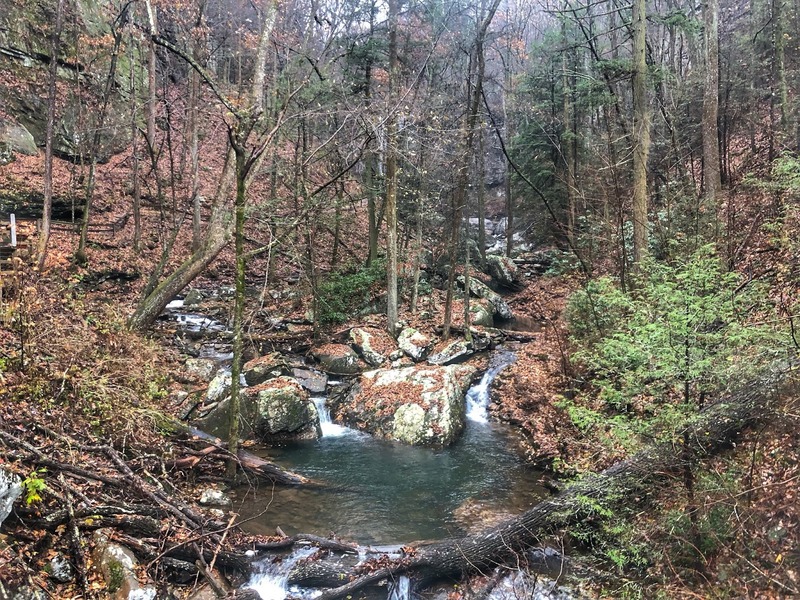 Along with the weather, the trails deteriorated as well. What had started as packed down single track trails had turned into ankle deep creeks or mudslides. It made finding your running rhythm very difficult, well, nearly impossible. Later into the race, lots of short climbs could not be runa s the terrain was way too slick and slippery to do so. Staying out of standing water on the trails was impossible as water was covering all of the trails by this point. The bottom of Lookout Mountain also featured a short bouldering section with a rope-assisted ascent. I think that would have been way more fun had it not been dark, cold and wet as hell. I lost some serious time on this section, but that really didn't matter to me. I had realized at the halfway point that a PR was highly unlikely and that was before conditions got really had. I was able to keep things together both mentally and physically. My wife was able to join me as my crew around mile 65 and it was just great to see her along the course for little mental boosts every few hours. I had changed my goal to sub 24 hours, but finishing was the ultimate goal. After 90+ miles, runners would arrive back at the start/finish area before completing another 8 mile loop inside the park. I was feeling pretty good rolling into this final AS. I got another boost from seeing my wife, refilled my bottles and headed out. I was ready to be done. What I did not know is that conditions had worsened big time along the trail I would have to run on for the next 4 miles. The rim trail was now completely under water, hiding both slick rock and roots beneath the surface. Running in this terrain had become impossible. 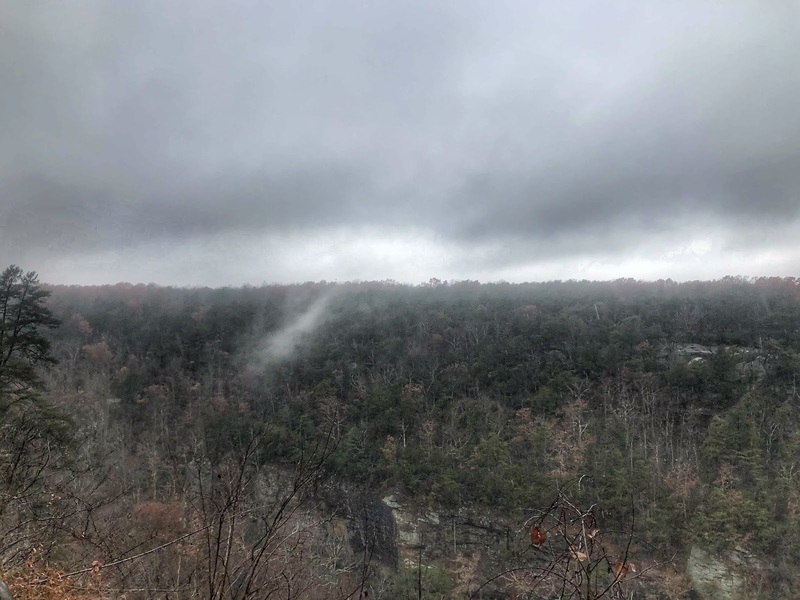 Unfortunately, the driving rain and wind had increased to a full blown storm and the temps were rather cold along the canyon rim as well. As I slowed to a walk, my body temp dropped quickly. So quickly, in fact, that I started to think of quitting, but I didn't even know where to go to seek refuge. All I could do was continue on and hope to get off this section as quickly as possible. This was the longest hour or so of my life. When I finally left the rim trail and entered the park road, I started to run what felt like 7 minute pace. I needed to get warm somehow. I could see the hand in front of my face, the rain was driving so hard. I kept running and cursing, cursing Sean and warning him not to send me on another trail loop before reaching the finish. Thankfully, the road section continued for a total of 3-4 miles all the way to the finish. I was elated to see the final arrow to the finish line and even happier when I saw the actual finish line, crossing it in 23 hours and 4 minutes for 6th male overall. I collected my high fives and hug from Sean followed by a hug from my wife before immediately heading for shelter. This was one hard earned buckle and I wouldn't want it any other way. Obligatory pre-race selfie with the entire crew (me, Jerry, Jeff, Paul and Jan, from left to right). In the canyon just 6-7 miles into the race.